The Features That Make GTS Platinum™ Fast! Lightweight parts, body and an air-cooled 149 CC Engine are combined to give you a vehicle that has the power to speed through trails. The air-cooled 149 cc engines give you the power you need to get through tough terrain. You will also have the suspension that is light but still gives you a smooth ride when going through rough terrain. It has dual A-arm suspension on the front and a rear swing arm suspension for optimal handling. It is also the only vehicle in its class to feature nitrogen gas shocks. If you want to have an off-road vehicle that looks sharp, the GTS Platinum™ features polished aluminum wheels, a sleek body design, and racing-style seats. You will be able to zip through trails in style. The GTS Platinum™ also features front mud guards for driving through some of the most inhospitable terrains. The GTS Platinum™ is also packed with luxury and safety features. To add to the appearance, the racing-style seats are equipped with five-point seat belts. In addition, the kart features a complete polished metal dash with a digital speedometer above the control panel. This kart also features all the standard roll-bars and protective features. If you are looking for your next off-road vehicle to get out in the woods, this is one of the best choices. 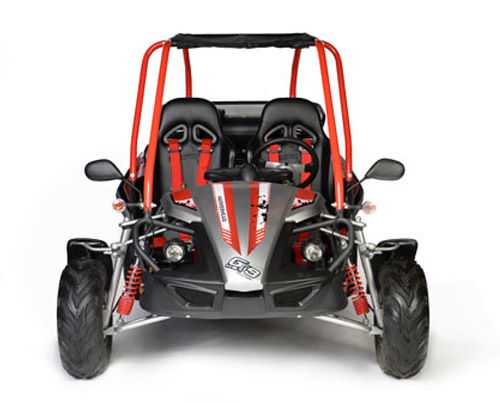 Contact us to get information about the kart that is changing the standards for personal off-road vehicles. Great partnerships have always been fundamental to our success. Our dealers have helped make Hammerhead who we are today, and we are continuously searching for outstanding dealers to support our growth for today and into the future. For more information on becoming a dealer please click here.